Ducray's ARGEAL SEBUM-ABSORBING TREATMENT SHAMPOO is strongly concentrated in Kaolin, which gently absorbs excess of sebum. It's presence of Sabal Serrulata also regulates the secretion of sebum. Safe to use frequently. 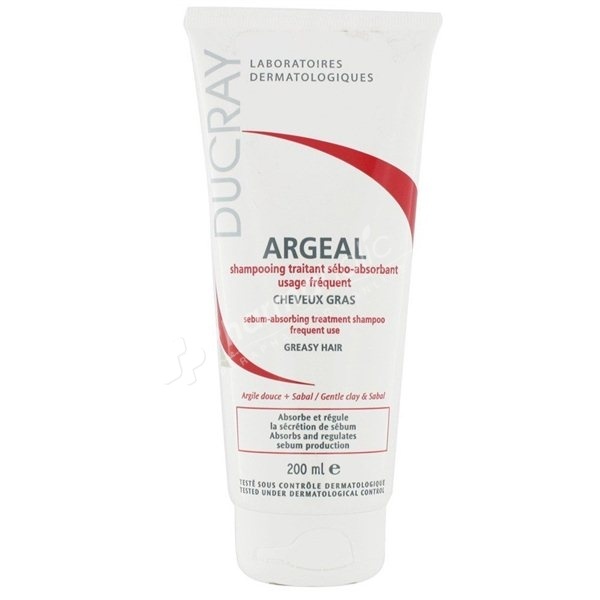 Ducray Argeal Sebum-Absorbing Treatment Shampoo is designed for greasy hair. Sebum is produced in small quantity to sheath hair and to protect the scalp from the external aggressions. Hormonal imbalance, stress, pollution can accelerate sebum secretion, which is then produced in excess and hair becomes fatty, oil-shiny and heavy. Usually, the more often you wash it, the fattiest it becomes, it is thus appropriate to choose a frequent-use-shampoo, specifically adapted to fatty hair. Strongly concentrated in Kaolin (soft clay), Argeal gently absorbs the excess of sebum and prevents it from migrating on the pillar stem. Apply using the tip on damp scalp, spread by massaging gently. Let stand on for 3 minutes, then rinse. Repeat once and rinse again. Dry your hair, without rubbing, and style as usual. Avoid the too hot brushings.